In 2018 guests of Silver Dollar City will find a brand new attraction, named Time Traveler, that will be the world's fastest, steepest and tallest complete circuit spinning roller coaster. The park has teased fans for months, and today revealed all the twisted details of the massive ride. 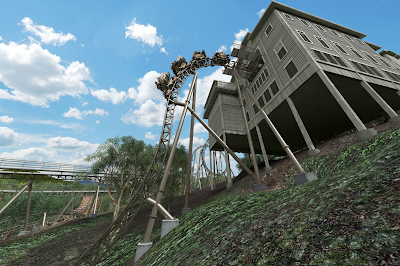 Custom designed for the theme park by Mack Rides, Time Traveler will feature magnetically controlled spinning vehicles that traverse 3,020 feet of track set in the mountainous terrain of Silver Dollar City. The project is the largest in the history of the park, coming in at $26 million. This schematic covers all of Time Traveler's major features, which are numerous. 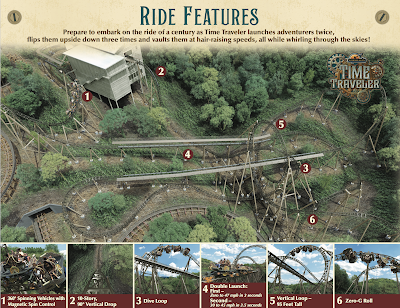 The ride's station sits at the top of a large ravine, and is themed as the workshop of "a young scientist, inventor and clockmaker by trade, Charles Henry." Mr. Henry is obsessed with the works of Jules Verne, and dreams of creating a machine that can defy time. 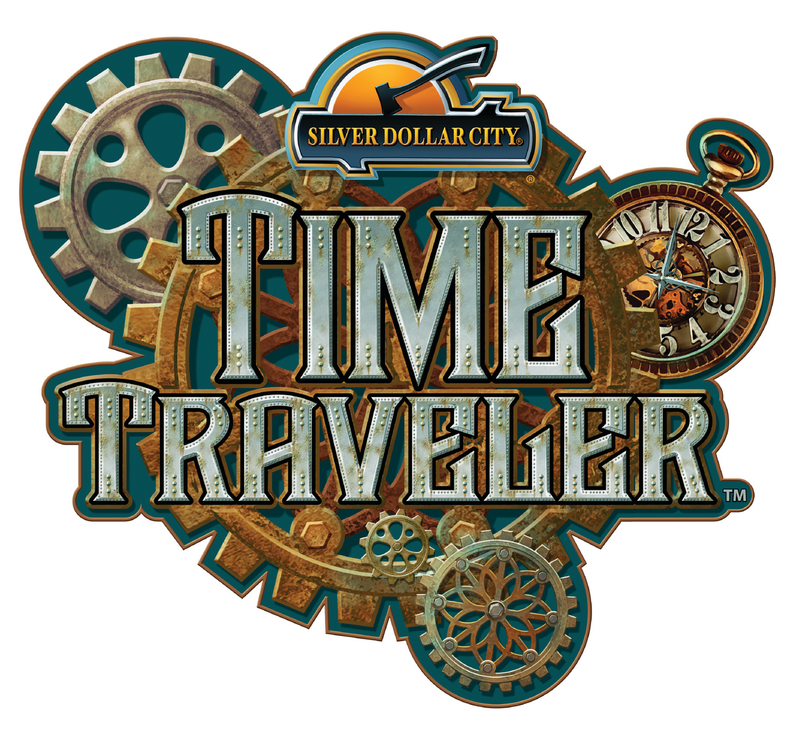 He has created a prototype machine that he is inviting residents of Silver Dollar City to try out, known as the Time Traveler. The coaster starts after passengers board one of three, sixteen passenger trains. Immediately out of the station, and seen above, the trains plummet down 100 feet at 90 degrees, reaching a maximum speed of 50.3 miles per hour. The trains then navigate a dive loop - one of three inversions on the ride. After some ground-hugging maneuvers, riders hit the first of two LMS launches, this one speeds the trains up to 47 miles per hour in only 3 seconds. 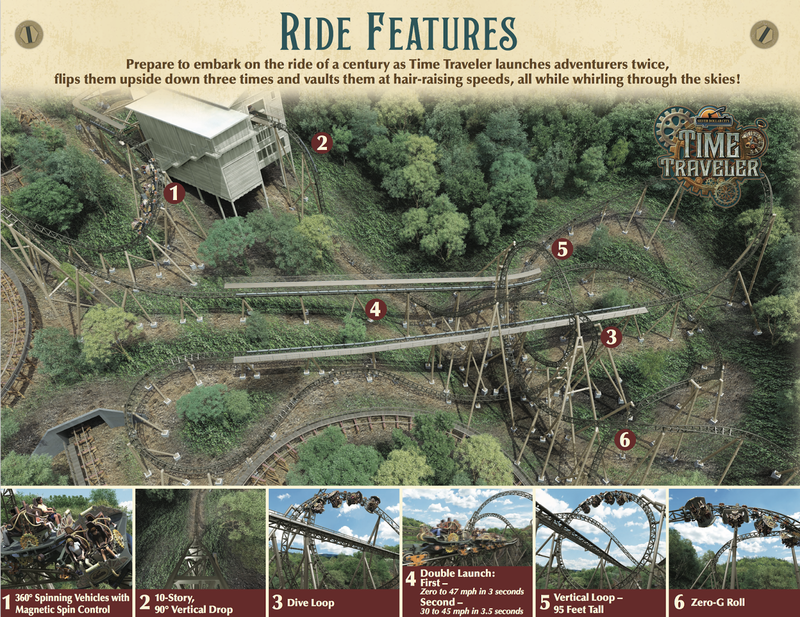 The launch sends the trains up and over a large turn, then down into a 95 foot tall vertical loop, the first of its kind on a spinning roller coaster. Upon existing the loop the trains soar through a descending helix and into a zero-g roll, then blast into the second LMS launch, this time going from 30 to 45 miles per hour in 3.5 seconds. The ride ends with a giant wave turn before trains make their way to the final brakes. 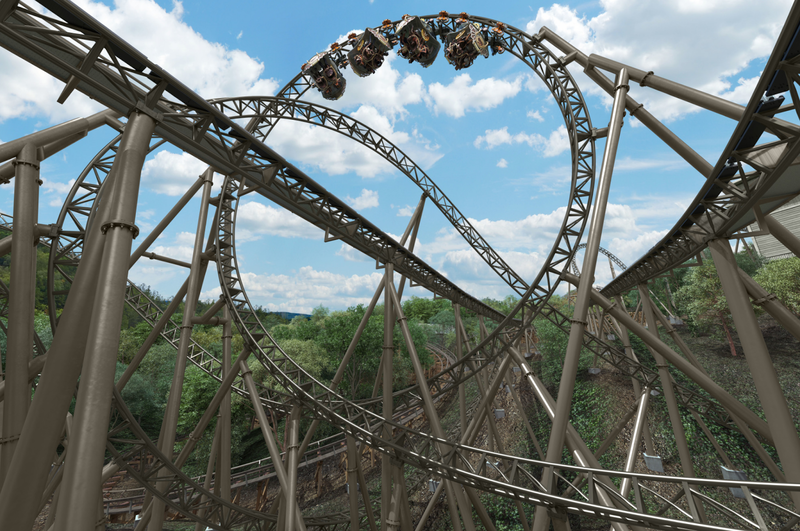 The twisted nature of the ride will see it cross over itself a total of 14 times from start to finish. The park's animation of Time Traveler shows both on-ride and off-ride footage that covers the layout from start to finish. 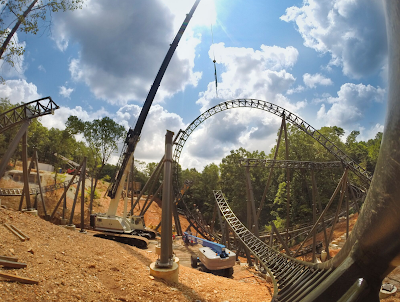 Time Traveler has been under construction for some time now, and just recently Silver Dollar City started to install both track and supports for the coaster. As a part of the announcement some photos of the current work were released, two of which are seen above. 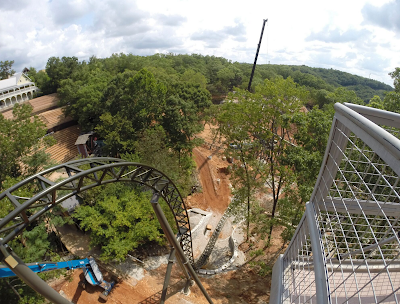 The ride looks amazing so far, tucked away within the wooded terrain of the park. Time Traveler will feature a 51 inch height requirement with individual lap bar restraints when it opened in Spring, 2018.